I am accepting that adoption trauma, mine and others, will never stop bothering me. I think when you survive something, it is a cause that it always close to your heart. It has served a purpose to make me compassionate for others that have been damaged by life. Sometimes by their own choices and sometimes not. Being an adoptee is what activated the activist inside of me. I will stand up for those who need me. I’m proud of that. The business of reinvention is a busy one. It’s been nearly a month since I have taken the time to blog. Now, on a quiet, sunny, Sunday morning, I find myself on my front porch with my laptop on my lap. Around the time of my last post, my Up 24 fitness band arrived in the mail. A few friends and coworkers had them and the concept of concrete date and accountability appealed to me. For most of my life, I have avoided exercise for one reason or another. Great excuses, explanations for avoidance, legitimate medical issues have kept me from it. 2 years ago I did Turbo Fire by Beach Body in the spring. It was great but life got busy due to a merger at work and I stopped making time for fitness. I looked great and felt great while I was doing Turbo Fire. I don’t recall that my anxiety and depression were improved at all but it was a crazy, crazy time. This time, however, with my daily minimum step goal of 10,000 steps daily, I notice a difference in my anxiety symptoms. The Up app tracks sleep and has a feature that you can track your food. You tell it what you ate, it add the calories and tracks the nutrition info. It’s nothing short of my new best friend. Rather than guessing at calories, skipping meals to restrict my calories/fasting, it’s helping me make better food choices. IU can see how many calories I am allowed based on how much exercise I’ve gotten. If I want to eat Tortellini Gorgonzola, I can walk at lunch or hop on the elliptical machine when I get home. This is the first time in my entire life that my attempts at better eating, fitness and weight loss are dangerous. When I see my therapist, she weighs me, as always, and reviews the highlights in my app. Yes, I am super motivated and last weekend covered 12 1/2 miles without ever leaving my house. Some nights, I’m jogging at the side of my bed to get to my goal. My husband and children have been so supportive. I’ve left behind statements about being fat or jiggly, which are uncomfortable for everyone, and I’ve talked about accomplishments. Things that never seemed possible before, seem within my grasp. Longer hikes, maybe even a 5k RUN? It’s so exciting! I’ve already seen results but more importantly, have felt them. My endurance is so much better. When I first started exercising again, I could only go 15 minutes on the elliptical. Lately, 1 1/2 hours is my tiring point. I’ll admit, I’ve become somewhat obsessed with checking my step counter over and over. I no longer sit in a desk at work but rather choose to stand. I can be found pacing back and forth while I am on hold with an insurance company. There is a large portion of my focus and attention on my step counter. This doesn’t leave time for WORRY! I am making new habits and my brain is better for it. I can’t help but say I wish I’d done this sooner. It won’t change anything though. The past is where it belongs and the future is now. Everything happens on God’s timing. Speaking of time, it’s time to get moving. I leave you with a new example of better eating. A recipe I created just this morning. 1. Preheat oven to 425 degrees (I’d do 410 due to altitude, the outside got brown before the inside was 100% baked.) 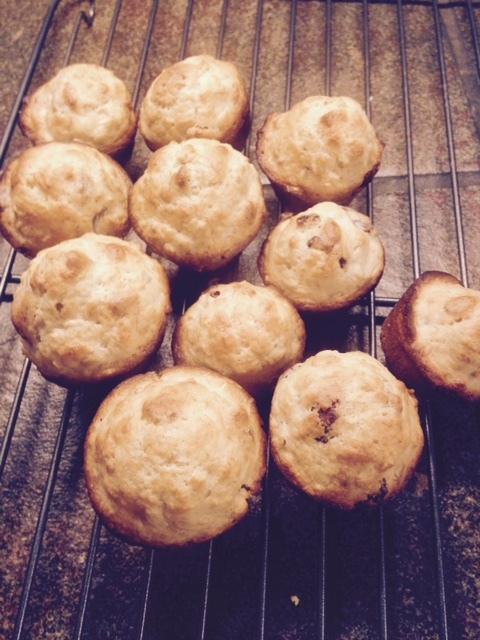 Grease muffin cups or line with paper muffin liners. 2. In a small bowl, add milk to oats and let it soak for 15 minutes. (Mine were Old Fashioned and soaked for 25 minutes. 3. In a second bowl, beat egg into the oil. Add completely smashed bananas to the oatmeal mixture and then and then stir into the egg/oil mixture. In a third bowl, sift together flour, sugar, baking powder and salt. Stir flour mixture into wet ingredients until just combined. 5. 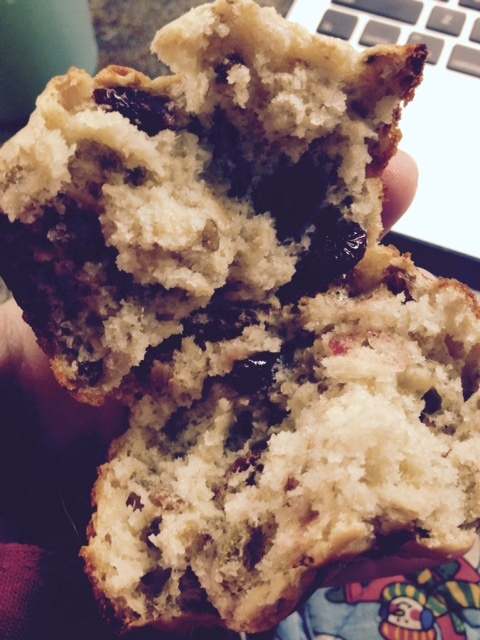 Bake in preheated oven for 20-25 minutes until a toothpick inserted into the center of a muffin comes out clean. The outside of the muffin should be golden brown. I choose to dump my muffins out immediately onto a rack to cool. Then I store them in a tightly covered container. The recipe above makes about 12 regular sized muffins. They are very filling and great for taking out on the trail. Putting either almond butter or peanut butter on them would be awesome. ENJOY!